Are being tested in homes for the elderly and expected to create about 400 per year. Tokyo – A group of Japanese researchers have developed a robotic suit for the elderly that helps support the movement of arms and legs through sensors. It also helps to walk, run and lift heavy objects. This suit could allow the elderly to lift objects weighing over 20 kilograms, and up to walk 10 kilometers a day. Just the sensors recorded electrical currents in the brain to the muscles through the skin and shortly before the natural response of muscles, activates the engine of movement of the suit. 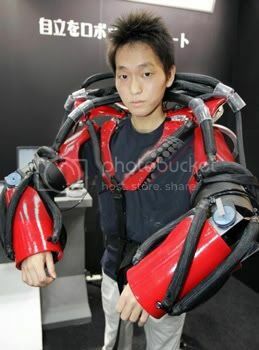 It is expected that the robotic costumes are a lot of utility daily life of elderly Japanese citizens. The robotic suit named HAL, developed by the team led by professor Yoshiyuki Sankai, University of Tsukuba, is being tested in institutional care for the elderly. With all of its components, the suit weighs some 23 kilograms, but because the heel section is in contact with the ground, the weight is not much of a burden to the user. It is expected that by 2008 the robotic costumes are traded or given on loan to institutions for rehabilitation.